IEA finances the contract employment of a professional advisor/consultant [i.e., UniServ Director] to deliver resources and assistance to leaders and members in local Associations that represent public schools and college/university employees. This assistance includes support for bargaining, grievance, employee rights, adjudication, crisis preparation and coordination, education reform at all levels, professional development, K-12 certification issues, and organizational development activities to recruit and maintain strong leaders in strong locals. IEA also funds the Southern Illinois regional office and meeting/training center in Carterville with highly skilled administrative assistants who provide logistical support for IEA staff as well as locals in the region. NEA also provides funding for the IEA UniServ operations and other local and state projects including specific local assistance grants and bargaining training. NEA conducts research that emphasizes increased salaries/benefits through tax equity, economic development, and adequate education funding; and development of compensation and organizing database technology. Funds are also allocated to recruit and retain members in all categories and produce internal communications about vital issues accessible to all members and leaders. IEA funds the Executive Director office that manages all staff employed by the state association and is responsible for employee personnel records, fiscal operations, coordination of IEA programs and budget and delivery of services including relationships between IEA and state government officials. IEA also operates, maintains and insures two buildings in Springfield: the IEA Headquarters and the Professional Development Center. The IEA Business Services maintain all financial records and reporting, employee records and membership processing records, includ- ing the costs of the Fair Share program. NEA supports its business operations at its Washington, DC Headquarters at a level that ensures organizational effectiveness through technology infrastructure, financial services, facilities services, and human resources to serve the needs of affiliates and its members. NEA also provides funding for emergencies at the national, state, or local levels. Implement advocacy programs for members including the Unified Legal Services Program, Fidelity Bond, Association Professional Liability Insurance, and $1 million per member Educators Employment Liability Insurance program. This includes legal training of Illinois Education Association staff and a Legal Department that deploys nine (9) in-house attorneys who have access to eleven support professionals. There is no charge to a member or local for the services and associated costs for an IEA attorney in any job related matter. IEA and NEA implement an inclusive, engaged governance process that fosters member participation and democratic decision-making through such governing bodies as IEA and NEA Representative Assemblies, IEA and NEA Boards of Directors, IEA and NEA Executive Committees, and IEA and NEA committees/task forces that formulate and implement organizational goals, objectives, and programs. NEA provides for Regional Leadership Conferences, Minority and Women’s Leadership Training, for IEA and NEA constituent group leadership and program development including support for councils such as Higher Education, Urban Education, Education Support Professionals, Retired, and Students. IEA and NEA fund efforts to strengthen existing partnerships and establish new relationships with diverse supportive organizations and businesses with an emphasis on outreach to ethnic minority communities and family-community organizations. Establish the public image of IEA and NEA as an advocate for great public education institutions through TV, radio, print, and cyber news including some regular reports to members and leaders. The Program Development provides the infrastructure for IEA training programs and professional development programs that directly assist ESP, Higher Education, retired, and student members. This includes information and technology needs, hardware/software maintenance and training, the in-house print shop, and the IEA telecommunications system. The Research Department supports local bargaining and building local association capacity by providing access to and analysis of education funding data and assisting staff and local leaders in the design, application and analysis of local association survey instruments, both online and paper. Generally assist IEA workgroups for in-house work projects and support external partners in the areas of education funding, education reform, and tax reform. IEA and NEA build bipartisan support for public education to enhance the fiscal and general well-being of our members that includes Illinois and federal level lobbying, government relations with state and federal agency officials, state ballot issues and legislative crisis fund, cyber lobbyists, and members’ education and mobilization on political issues. IEA specifically lobbies the attorney general and state education boards [e.g., ISBE, ICCB, IBHE] to produce opinions and/or legal opinions directly beneficial to active and retired members. Advocate for qualified teachers and support professionals in every classroom and work site; create learning conditions that close achievement gaps, particularly for low income and minority students; increase graduation rates through teacher preparation, certification and development, and working conditions that improve compensation; health care; retirement security; ethnic minority community outreach; and research and documentation on testing and accountability. Support English Language Learner policies, best practices, and programs. This document has been prepared by Region 2 UniServ Directors, Jim Clark and Matthew Johansson, based upon analysis of the Illinois Education Association Allocation Report for the 2011-12 Budget Year and the National Education Association allocation report for the same year as printed in Appendix D of NEA materials provided to Fair Share fee payers. 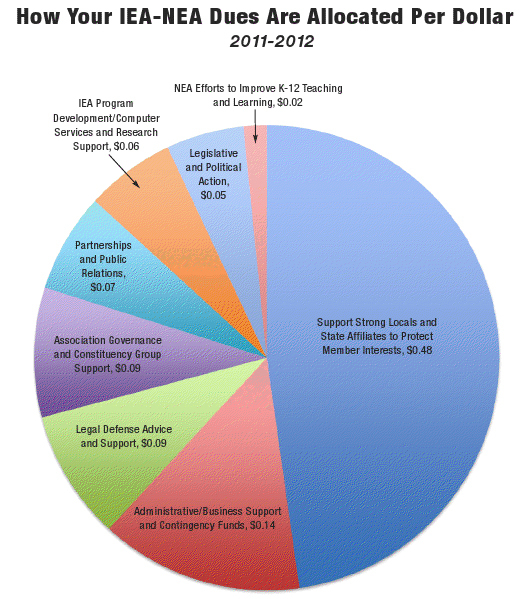 The NEA budget is based on 3.2 million members. The IEA budget is based on 133,000 members. The breakdown above reflects strategic allocation of those combined dollars of an individual member’s per capita dues obligation to the IEA and NEA. Local dues and the refundable I-PACE contribution are not included in this analysis.